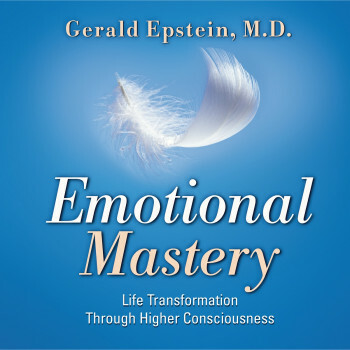 Emotional Mastery: Life Transformation Through Higher Consciousness by Gerald Epstein, PhD. Anxiety. Fear. Depression. Worry. Panic. Rage. These are distressing feelings that we all experience from time to time. However, during this time of great economic and cultural upheaval, such emotions have become all too common — often a daily occurrence. Are you ready to detach from those distressing emotions and embrace a new way of living that leaves you calm, confident, and creatively alive? These powerful one-minute practices are the keys that will open the door to your better future. Transform the energy of any distressing emotion in just one minute! Take charge of your emotions so they don’t take charge of you! Mastering your emotions allows you to face any circumstance and use it in a way that benefits you. It literally changes the course of your life. In Emotional Mastery: Life Transformation Through Higher Consciousness, Dr. Gerald Epstein introduces a collection of short imaging techniques that transform the specific challenges you are facing today. Emotional Mastery gives you a powerful skill you can use anytime, anyplace to transform negative emotions and gain a new, constructive perspective in any moment. Find out just how easy it is to take charge of your emotions so they don’t take charge of you!